TOM McCALL NATURE AREA: Your eyes aren't fooling you--- the grassy hills and sunny oak flats you're seeing are only a half hour drive east of the rain-soaked forests of giant firs near Multnomah Falls (LINK)... We're at Tom McCall Nature Preserve, famed for its spring wildflowers and year-around vistas of the Eastern Gorge and Rowena Gap. 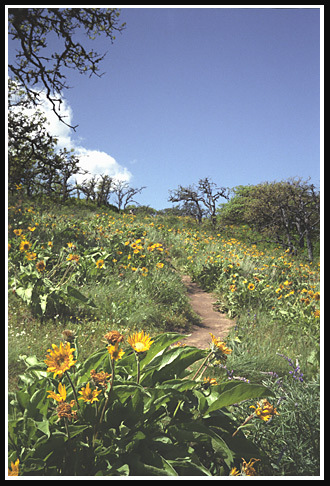 In my picture above, we are about 3 weeks past prime wildflower season. 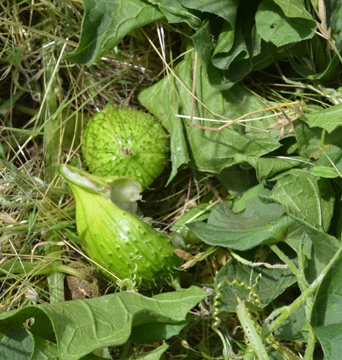 But blue flowers were in season, as well as what appeared to be small native cucumbers. The tip of 11,245 foot Mt. Hood peeks at us from a distance. In the Eastern Gorge, it is common for summer days to reach over 90 degrees, and 100 is not uncommon.....Portland's "early morning clouds" rarely make it up the Gorge past the small town of Hood River, leaving the areas further east with frequent cloudless days and heat to match....The yellow flowers are Balsamroot, which has a root favored by Native Americans for culinary purposes; some purple lupine is also visible. For another amazing Oregon contrast, you could drive to Mt. Hood from this spot, and within an hour you would be standing at Timberline Lodge, where the yearly snowfall of about 600 inches doesn't melt away until June! (Skiers count on the fact that the only reliable summertime skiing outside of Alaska thrives on Mt. Hood, on the 8,000 foot Palmer Ice Field..... Many high-powered downhill ski racing and training camps know this). Across the Columbia River from the McCall Nature Area pictured here is the Klickitat River. This unpeopled beauty flows down from the eastern glaciers of mighty Mt. Adams. Recently, a "Rails to Trails" project of major proportions opened this area up to wonderful hiking opportunities that had not previously existed. Now there is the unparalled possibility of hiking some 30 miles. This trail will take you from the Columbia River lowlands up the canyon of the Klickitat, thence into a side canyon called Swale Canyon, and eventually you will come out at about 1,600 feet elevation. All around you will be the wide sweeping grasslands of the Goldendale Valley, and you will be near the County seat of Klickitat County (Goldendale, with its very fine public astronomical observatory, Goldendale Observatory State Park. An old friend of mine, Steve Stout, is in charge and can thrill you with the lore of astronomy). 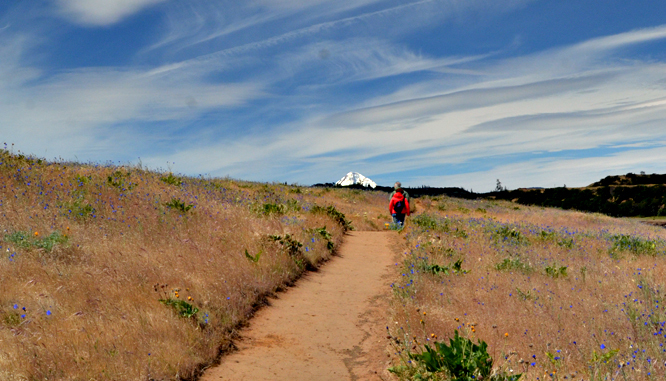 Please visit this website to learn more about this new Trail: Klickitat Trail Conservancy. It's a sad place, two deaths happen here. One is current and ogoing, namely the beautiful Deschutes River ending its existence. 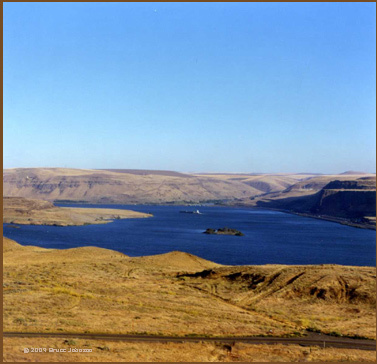 Back in 1957, this big blue lake buried one of the Northwest's most revered Native American cultural sites, the salmon-bounty of Celilo Falls. That was a grim Spring, the united tribes and bands of the entire region had lost a 12 year battle against the erection of The Dalles Dam .....Now all that remains is the tiny Indian village of Celio Village, looking decrepit and without heart. The Columbia River Indians, the River People, do not have a Reservation, it is only a small patch of Trust Land of under 10 acres. If you travel across what used to the the life-giving river you will find Indian petroglyphs, carved long ago into the basalt columns, when the rapacious Whites were not yet even a bad dream.... The petroglyphs are now in a Washington State Park named Horsethief Lake. "She Who Watches" is probably the most famous of the petroglyphs... Click here for link to two maps of the historic tribes of Oregon and of North America...Tommy Thompson, Hannah Sohappy, Howard Jim, Nancy Jim, Rock Creek Band, Wayam, The River People. Back on the Oregon side, don't miss Deschutes State Park, a small park at the confluence of the Deschutes River and the Columbia River. My oldest son and I used to camp there a lot, especially enjoying the kayaking. If you were to travel up the Deschutes River for about 80 miles, you'd be at Lake Billy Chinook, named for a Wasco Indian scout.schutes State Park).